It would have been nice if Luke had told us just what Jesus taught the people that day. Did it have something to do with what follows? Luke doesn’t say. But, what I think we can say is that the Divine Service conducted on this beach is the pattern our Lord has established for His church in every age. First, the service of the Word, where we press in to hear the Word of God. Then the service of the Sacrament, where the Word of God is pressed in on us in a very tangible, physical way. No, from hearing the Word of God, which is, “since we have been justified by faith, we have peace with God…” we go to work at whatever our present calling and vocation in life might be as beloved children of God. We dare not over-spiritualize what’s going on here. This is very practical stuff. Peter and the others are fisherman. That’s their daily vocation. Jesus is concerned that they have enough food to put on the table for their families. So Jesus says, “let’s go fishing.” He could have commanded the fish to jump right up onto the beach for these fishermen to simply collect and take home, He doesn’t do that. He will provide them food for their table through their work and vocation! Despite his bit of whining, Peter’s response is commendable and should stand as an example to us all. What Jesus tells these men to do is contrary to experience and common sense. Experienced fishermen know that the best times to fish are the evenings. 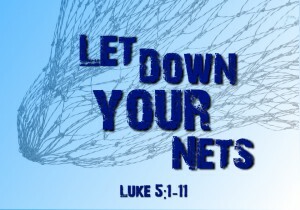 And if you’re net fishing, which they are, you throw your nets along the shallows and not in the deep water. But Jesus turns this around and tells them to put out into the deep during the day. Generally speaking, when God’s Word contradicts human reason, we will side with human reason and reject God’s Word. We all think we know better than God. But Peter shows us what it means to live by faith. When God told Abraham to take his son, his only Isaac to the mountain to sacrifice him, this made no sense at all, because God had promised that it was through Isaac that God’s promise would be fulfilled. But Abraham took Isaac to the mountain. Here, Peter follows in Abraham’s footsteps. And now on this day on the Sea of Gennesaret, the Word of God was in a small boat with three fishermen and His Word went out, and their nets were filled to the point of breaking and their boats were filled to the point of sinking. “Behold Peter and James and John, God is very near you. But Peter’s response is very strange. Instead overwhelming joy, Peter experiences overwhelming fear. There is a crisis at sea that has nothing to do with the fact that the boats were sinking. The crisis is – the fishing is too good. This is too generous. This is Peter’s ‘Epiphany.’ He now realizes who it is who is in this boat with him. He who knows what is in the dark, deep of the sea and is able to call it to the surface has called that which is in the dark, deep of Peter’s heart to the surface. And Peter knows that he too has been caught in the net. And now, not only this boat, but the whole world is too small for him. But here, as it concerns how we are to regard our Lord in light of our sinfulness, Peter is an example that we should NOT follow. For Peter does not believe that Christ is gracious and merciful and has come into this world to redeem sinners just like Peter, and just like you. But we do not then command our Lord to “depart from us” to let us alone in our sin or give us some time to work things out and make things right. No, we implore Him to forgive us. For that is what our Lord has come into this world to do. “Peter, you did so well when you said ‘fisherman, be gone’ and simply trusted Me. Now you should say, ‘sinner, be gone.’ And simply trust Me.’ A different kind of person is needed here, namely, one who doesn’t worry about whether he’s a sinner or holy, but simply and without fear, puts complete trust in Christ’s word of forgiveness. And the truth of the matter is that it is as we learn to trust in Him for providing all that we need for our soul, that we can also trust Him to supply all that we need for our body. As St. Paul tells us, “He who did not spare His own Son but gave Him up for us all, how shall He not also with Him graciously give us all things.” (Rom. 8:32). Let us be like those on that beach by the Sea, who were pressing in on Jesus to hear the word of God, that we may be strengthened in this one, true faith, not only that we might go to heaven when we die, but also that we may do the work that God has given us to do now, according to His Word.